This is too good to be true, yet it is. Earlier this year we visited a friend's impeccable home and found that their guest bathroom was completely, I mean completely mirrored, well, except for the floor. It was wild. It was like having unlimited tickets to the fun house. I wish I had brought a laser pointer, maybe a couple of them, in different colors. Oh, and a smoke machine. I did have a flashlight and had some fun with that. 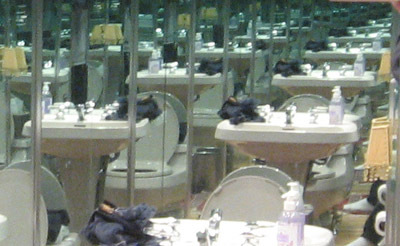 Seriously, when do you get a chance to be in a completely mirrored room? Then there are the sci-fi/fantasy/horror/mystery possibilities. Like wouldn't it be cool to imagine if someone or something showed up a few "reflections away", like they were in another room. I remember reading a science fiction short story about a guy who lived in a tesseract, a four-dimensional cube. That's what this bathroom reminds me of. This is the only picture I managed to take that didn't have me in it. See the complete picture.